Philadelphia Eagles quarterback Carson Wentz.will have some unfinished business in 2018. The Eagles return to the field for OTAs next week, which is crazy because it feels like just yesterday they were beating the Patriots in the Super Bowl. And just as the weather has been heating up, so too have the takes. One gasbag has been so bad, in fact, that he actually forced our own Jimmy Kempski to acknowledge his existence and, in doing so, knock him down a peg. Or two, if there are even that many left before he hits the ground. That being said, Colin Cowherd seems like the exception rather than the rule when it comes to how the national media view the Eagles following their first Super Bowl title – did we mention that they beat the Patriots, 41-33, in that game? – and it's becoming increasingly easier to find positive stories about the Birds than negative ones. "The Comeback Kid" isn't just the name of the greatest Parks and Rec episode (and greatest blooper) of all time, it will also describe the Eagles quarterback this season. And if he plays anywhere close to the level he was at before tearing his ACL last year, he's almost a guaranteed lock for Comeback Player of the Year. Well, he was also playing at an MVP level, so it would stand to reason that a return to form would like put him in that conversation once again. ESPN had their insiders do some more predictions, including who they think will win MVP in 2018. And while several said Aaron Rodgers, there was one vote for Carson. Speaking of Carson, there are going to be quite a few more running around Philadelphia in the near future. According to the US Social Security database, there were 301 babies named Carson in Pennsylvania in 2017, a clear spike from recent years. And we’re at the intersection of Chase and Carson. In 2017, for the first time in the last decade, there were actually more babies named Carson (301) than Chase (299) in PA. And it’ll probably be that way for a while. 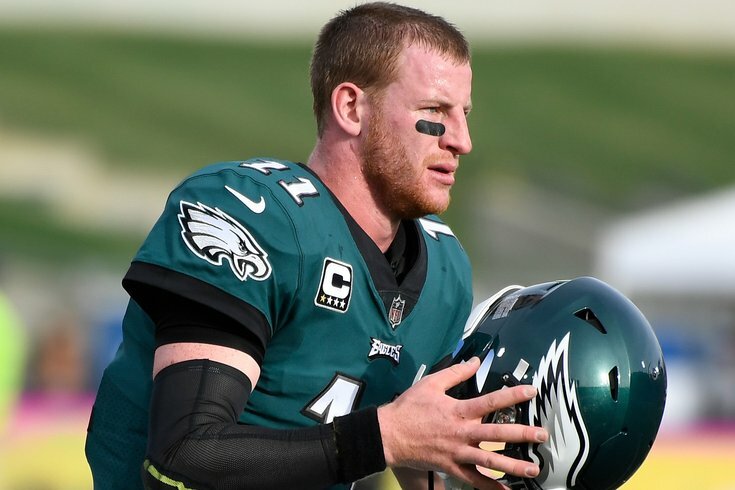 Below are five numbers — courtesy of Sportradar — about Wentz that outline both his strengths and what he needs to work on. Remember when everyone hated Howie? Me neither. [Notre Dame RB Josh Adams] looks like an early-down back, who can contribute to a committee as opposed to a workhorse asset, though, he fits well in an Eagles backfield that lost a downhill runner in LeGarrette Blount during free agency. Bruce Hector and Joe Ostman could make the roster as an underrated pass-rushing tag team on the defensive line. The former finished a three-year college career as a wrecking ball on the inside with 18 sacks. The latter took down the quarterback 26 times in his time at Central Michigan. The Eagles front seven would certainly improve with either Hector or Ostman in the rotation. If they both manage to earn roster spots, Philadelphia should lead the league in sacks.